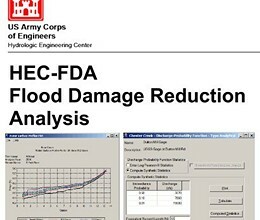 The Flood Damage Reduction Analysis (HEC-FDA) software developed by the U.S. Army Corps of Engineers' Hydrologic Engineering Center (HEC) provides the capability to perform an integrated hydrologic engineering and economic analysis during the formulation and evaluation of flood risk management plans. 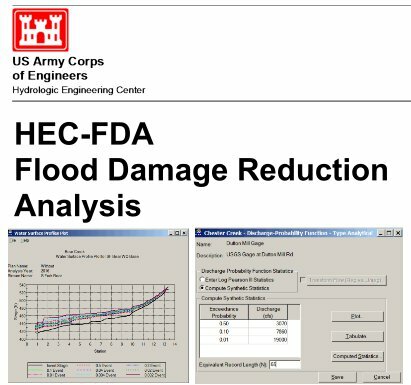 HEC-FDA is designed to assist U.S. Army Corps of Engineers (USACE) study members in using risk analysis procedures for formulating and evaluating flood risk management measures (EM 1110-2-1619, ER 1105-2-101). Also, the sofware will assist USACE staff in analyzing the economics of flood risk management projects. The software, 1) stores hydrologic and economic data necessary for an analysis, 2) provides tools to visualize data and results, 3) computes expected annual damage (EAD) and equivalent annual damages, 4) computes annual exceedance probability (AEP) and conditional non-exceedance probability as required for levee certification, and, 5) implements the risk analysis procedures described in EM 1110-2-1619. The software follows functional elements of a study involving coordinated study layout and configuration, hydrologic engineering analyses, economic analyses, and plan formulation and evaluation. HEC-FDA is used continuously throughout the planning process as the study evolves from the base year without-project condition analysis through the analyses of alternative plans over their project life. Hydrologic engineering and portions of the economics are performed separately, but in a coordinated manner after specifying the study configuration and layout, and merged for the formulation and evaluation of the potential flood risk management plans. * HEC-FDA download link provides gnu general public license version of the software. HEC-FDA has been rated 1.0 out of 5 points. A total of 1 votes cast and 0 users reviewed the software.